Can you be more patient? Can you be more patient when your two-year old throws himself on the supermarket floor with bloodcurdling screams for seemingly no reason? Can you be more patient when you try to put together a nutritious dinner while kids are bickering or demanding your attention every two seconds and the baby is trying to crawl off the sofa head first? When did she learn to climb on it anyway? My own four children only chose to have a meltdown of apocalyptic proportion when I’m running on empty. (I have a theory about this that I will share with you one day). For any parent who knows how quickly a nice enough day can tailspin into chaos, I want to offer one simple trick that will make you a more patient parent. I grew up convinced that patience was the equivalent of the word waiting. You grit your teeth and you wait for things to get better without losing your cool and without getting angry. For years I vacillated between (1) a self-serving conviction that patience is an inborn talent akin to music ability and therefore can’t be changed, and (2) a believe that patience is a skill that can be cultivated… somehow … I just wasn’t sure how. When I allowed for the possibility that it was indeed a learned skill I practiced patience using a technique I took out of a dog training manual. I would put a piece of chocolate in front of me on the desk and make myself study for two hours before I would let myself eat it. If there was ever any advancement in my patience, I didn’t notice it. I did notice an unhealthy obsession with chocolates, but that’s a whole other story. 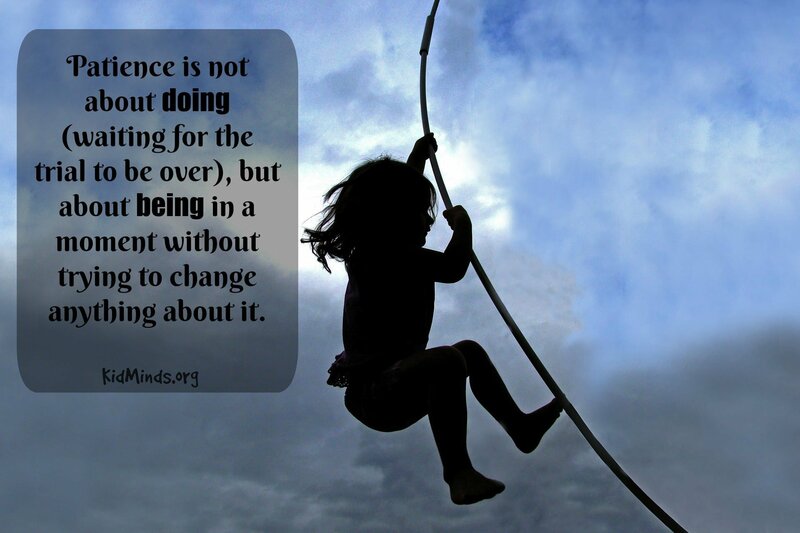 It took me a few decades to discover that patience is not about waiting, but about acceptance. On the surface it doesn’t seem like a profound distinction, but in reality it completely changes the essence of the situation and requires a completely different set of skills. I invite you to explore the possibility that one small mental trick will make you a far more patient parent today. When you think about patience in terms of waiting, you essentially tell yourself that the present is not to your liking, but if you can only wait it out things will get better. The problem is that when you are tired, stressed, and ready to drop, you don’t have it in you to wait for a future reward. You just want a break right now! The world is pushing you and you are done! You know that theoretically it’s a good idea to be more patient but “Not today! Not right now!” And you explode. Sometimes there is that split second where you actually give yourself permission to charge right ahead and lose your cool. You feel justified. Other times, it happens so quickly, it doesn’t even seem to be a choice and abruptly there you go, screaming, stomping, and doing other things you will feel guilty about later. It stops being about future reward and becomes all about the present. This is the moment I’m living through right now and it is what it is. It stops being about doing (waiting for the trial to be over) and becomes about being in a moment without trying to change anything about it (bad traffic, bad drivers, kids squabbling in a back seat, report deadline in a few hours, whatever it is pushing you). It is no longer about something we deserve that we are not getting (I deserve to have dinner without anybody throwing any tantrums); it is about accepting that going straight through the experience is the shorter route to the other side. Patience as acceptance doesn’t mean you approve of the situation. My kids should always treat me with respect. They should and there are many different ways to work on that, but you are NOT going to teach them to respect you by losing your patience in this moment. Patience as acceptance means letting go of judgment. Impatience so often stems from the difference between our expectations and our experience. Patience as acceptance means acknowledging that you can’t change people and circumstances, but you can change your mindset. Then when your authority, your plans, or your desires are threatened you can respond in ways that are most beneficial to you. Acceptance is actually self-serving. Struggling against what is takes a lot of energy (your heart rate goes up, your hands are shaking, or you might be screaming expletives). By relaxing into the experience, you reduce stress, boost your immune system, lower your blood pressure, and increase your overall happiness and well-being. Patience can bring out the best in people around you. When others see you being patient in the eye of the storm, they imitate. Their heart rate slows down. So how can you use this new trick today? Decide you want to be more patient. It will give direction and focus to your subconscious mind by stating clearly what it is you are after. But don’t just state, “Patience! I want more patience!” Relax your shoulders, let the jaw drop, breathe so deeply that you can feel it in your toes, notice your body filling with something new you are trying to create in your life and say the word: acceptance. Feel this new thing filling you up. When you really relax your shoulders you let them physically fall an inch. When your shoulders are curled in, your breath can not energize you. Say it with me right now, acceptance, just to learn how this word feels in your body. The next time your kids are going nuts whether it’s bedtime or they refuse to eat your carefully prepared dinner, silently say, acceptance and lengthen your exhalations. When you exhale longer, you naturally take a longer breath in. Actually feel the lungs filling with new air and repeat, acceptance holding on to the word to give your mind a focus. Don’t try to make anything happen, except to make sure that the kids are not in danger of being harmed. Just say the word and breath, it will introduce a time gap between impulse and action. When you calm your body, the mind follows. Try to think of acceptance as a magic word that will make everything better. And it will! You have heard of the athletes rehearsing their routine in their mind before the big performance? This works for parenting too! When a situation makes you lose your patience, take the time to go over it in your head and then file it in your mind with a better ending. If you visualize how it will feel to respond to situations in this new patient manner, it will become more available when you need it. 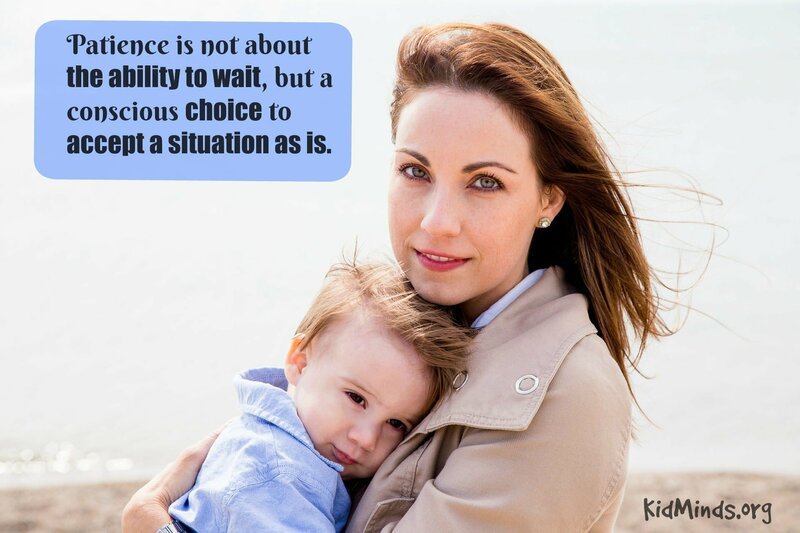 Thinking of patience as acceptance instead of waiting transformed the way I approach emotionally charged situations. I invite you to try this little mental trick to make yourself feel better next time your child, spouse, or life is throwing a tantrum. Easier said, than done? Like everything else in life, the more you do it, the better you get at it. If you slip up (and if you are human, you will), you will get a chance to try it next time. People of all ages learn best when they are in a positive place. Being more patient with yourself translates into being more patient with others. Just making a conscious decision to be more patient and accepting will begin a wondrous transformation. Do you struggle with patience? What are some of the things you usually do to be more patient? This is so helpful. 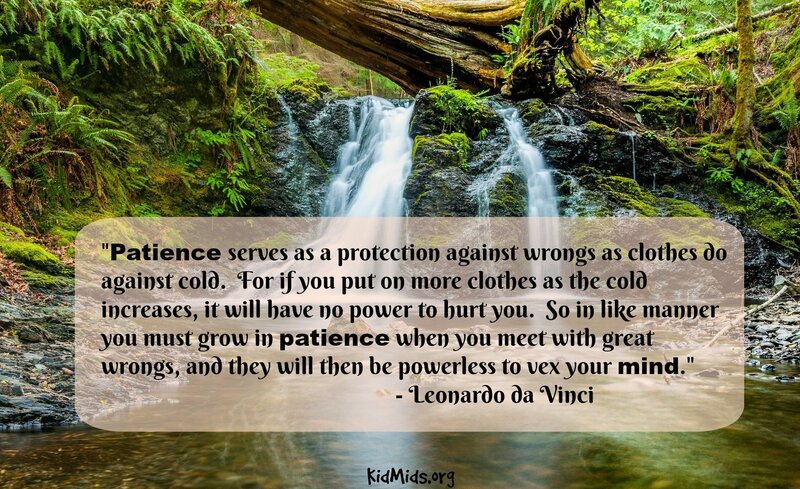 I think most parents could use more patience in their lives. Thank you for sharing these tips! I’m glad this post was helpful for you. Patience is something so many do battle with, including me! This mental shift in focus might just be the help I need. 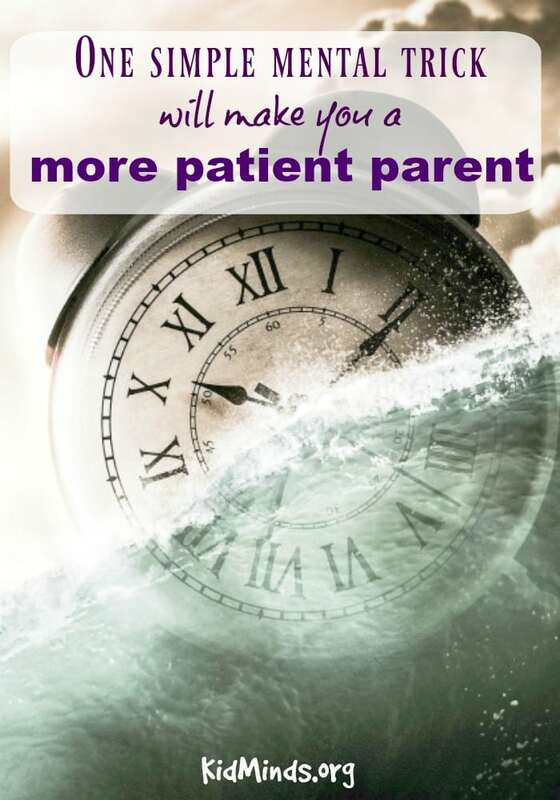 Hey Buddy!, I found this information for you: "How to be a more Patient Parent – the one simple trick you need in your life". 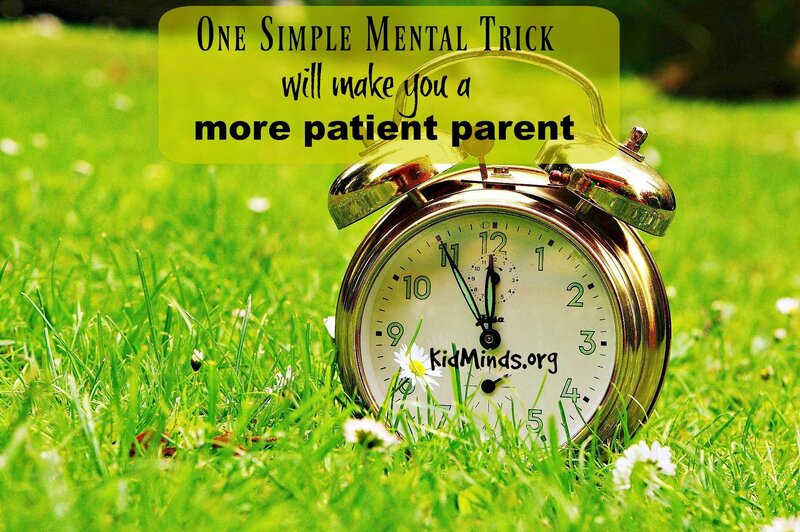 Here is the website link: https://kidminds.org/how-to-be-a-more-patient-parent-the-one-simple-trick-you-need-in-your-life/. Thank you.